The blue section shows stars and fiber optics, Magic Tower (where we stayed) is where the red Disneyland Hotel lighted building is in the right. Walk in Walt’s Footsteps tour is great. Worth the cost and time. Puts the park into perspective about Walt, and we heard little stories and information we never knew or noticed before. Meet at 9:15 for a 9:30-12:30 tour and it includes a lunch of your choice of sandwich, seasonal fruit or bag of chips, two chocolate chip cookies and your choice of soft drinks or bottled water — served 12:30-1:00 pm. Lunch is included in the price. We saw the interior of Club 33, the interior of the fire station with facts about Walt’s use of it as well as his apartment above, we rode the Lilly Belle train car (that’s not assured, the tour guide has to obtain prior permission and train car can’t be booked for another group), displays of 50th Anniversary exhibit were shown and explained — but not the movie of it — and we went on the Jungle Cruise (through the exit marked “Excaping Passengers”!) and into the Enchanted Tiki Room where they showed us one of the flowers unattached in the attraction — and let each of us operate it to make it “talk.” We walked through New Orleans Square, by the Matterhorn and it’s a small world, Snow White’s Grotto, the Fantasyland Carousel, and Sleeping Beauty Castle — as well as along Main Street U.S.A. where we were shown the output vents of the “smellitzer” that makes the aromas available outside of various shops, and had windows along the street explained to us. After the tour we saw the Steve Martin movie about the 50th Anniversary. Our son bought some light-up Mouse Ears and I bought a princess version for a young distant relative who had a bone marrow transplant last year, and we had those stitched with names. Next we rode the train on a “grand circle tour of the Magic Kingdom”, saw the Grand Canyon and the dinosaurs. At 3:00 pm we left the park to rest (after getting our hands stamped), upload things to this travel blog, then got ready for dinner at Napa Rose. Dinner was superb. Michael wants this caliber of food at his school cafeteria (heh, wouldn’t we wish!). Annual Pass discount not done at Napa Rose. For three adult entrees, three adult menu soups, two glasses of wine and Coke, three desserts, tax and tip a fortune got spent there, well into triple digits. Rich will cancel our coming back due only to the expenses. Fabulous meal! I was too pooped after the meal but Rich and son returned to the park after a change of clothes. They went on Autopia (you get a drivers license souvenir for free there, for $5 you can make it a photo drivers license but they didn’t do it that night… Michael and I did that another day), took the monorail into and out of the park (one time we couldn’t leave on it because it was closed at the time, being too close to when the fireworks go off), saw Fantasmic! (better than when we saw it last 13 years ago and better than in Florida, Rich said) and POTC for the second time of the trip because Michael liked it so much (and we all agree it is better than in Florida). A meeting up with an E-friend and family didn’t happen that day. Today at 9 am we’re have a character breakfast with Minnie and her friends at Plaza Inn in Disneyland, and we have the rest of the day and night free to do anything we want in the park. We night try again to meet up with the E-friend. Wednesday we pick up a rental car in the morning, travel to Legoland with E-friend and family in separate vehicles, move from DL Hotel to Grand Californian Hotel, and have dinner at Ralph Brennan’s Jazz Kitchen. Friday we meet Michael Broggie and tour Walt’s barn and see his trains, see the “College Road Trip” movie at El Capitan Theatre and try to find Walt’s grave. Saturday we leave for home and return the rental car at the airport before taking our flights. Have a great day where you are. Proud to be among the best blogs featured on Blogs of the Day and the Disney Echo forums. Enter your email address to subscribe to the Disney Echo and receive notifications of new posts by email. This website is not affiliated with any part of The Walt Disney Company. The Disney Echo at DisneyEcho.emuck.com is your interactive online magazine to discover new wonders and share magical Disney memories. The display on this page is set up to show the posts in reverse chronological order of when they were posted originally, so if you want to read the reports from the beginning, go to the last post on the last page and work forward. The first entry about the Koster family's July 2008 Disneyland trip can be found by clicking here and the first entry about their Easter 2008 Disneyland trip can be found by selecting this link. That link goes to the very first travel-related article on this website: Welcome to our Trip Report. The entry made after that first one is found after clicking the link named "Our Vacation Plans At-A-Glance" and that link is found above and below the first entry. The third entry is similarly found after clicking the link above and below the second one, where the link is named "Packing Up"
One can read all the travel-related entries in the order they were posted by going to the next entry and the next entry the same way. Otherwise, this website defaults to displaying the most-recently-posted entries followed by older entries below it on the page as well as on the pages after it. For more details, see What's a Disney Echo? If you are enjoying the reports here, SUBSCRIBE to the Disney Echo blog so you will be notified each time a report comes in. FTC-Mandated Disclosure: As of December 2009, bloggers are required by the Federal Trade Commission to disclose payments and freebies. Unless otherwise noted, Rich Koster did not receive any payments, free items, or free services from any of the parties discussed in these articles. He pays for his own admission to theme parks and their associated events, unless otherwise explicitly noted. Share what you think about the Disney Echo! Anyone can reply to items on this website if you select the word "comment" or "comments" at any portion of the blog you'd like to comment about. DISNEY ECHO VISITORS/SURFERS: Read This Topic! Quick! Lock in your iPad’s, iPhone’s or MacBook’s price now with this link! I helped with iPhone: The Missing Manual. Please buy it here! Cover Blurb for Who Wacked Roger Rabbit? Follow Roger Rabbit creator Gary K. Wolf on Twitter. P-p-p-please! I’m making $215 $230 selling my old iPhone 4S to @gazelle but you could get even more! 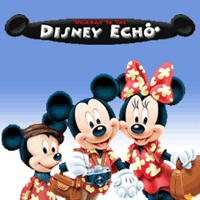 The Disney Echo has been visited times by Disney fans since June 18, 1998. We're glad you dropped by!